If you have any questions or want to enquire about dates, use our form to contact Susanna Ballerini or see their website for more information. A sparkling star in Tuscany’s firmament. 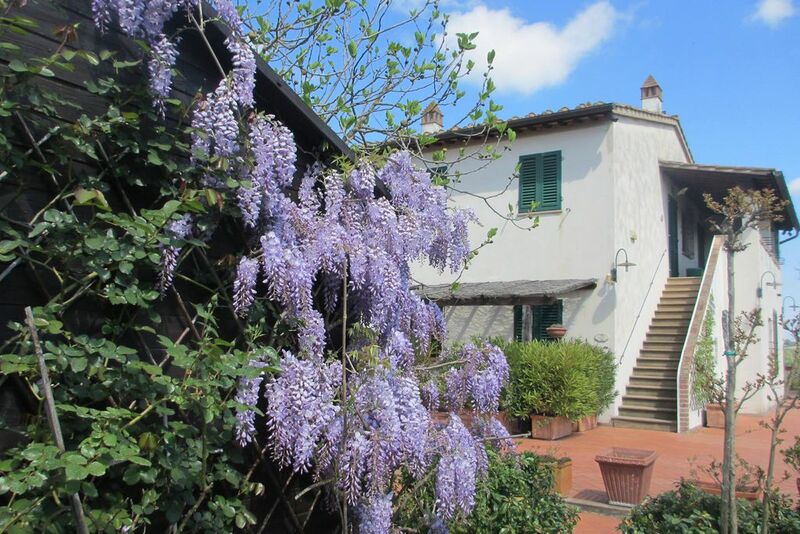 The 200-year-old locanda is on a ridge, embracing fields and farms and heavenly sunsets. Bedrooms in the farmhouse are part rustic, part refined, with bold colours and pretty lace at the windows, each space unique. Beds are modern and comfortable, furniture 18th- and 19th-century, bathrooms have bath tubs and showers, and some rooms have kitchenettes. Tennis, cycling, swimming in the saltwater pool with its panoramic view – all are possible; or simply relax under the dreamy gazebo and dip into an art book from the library. Even the geography is enticing, in the charmed triangle formed by Florence, Siena and Pisa. Susanna is full of life and laughter, and concocts dishes that people travel miles to discover. Fruit, vegetables, herbs, saffron and olive oil are all home grown, there are plenty of wines in the cellar and, outside, the biggest pizza oven ever. Heart-warming, creative and definitely special. 10 November - 15 March. Susanna is the perfect host. Always available for advice or help, but leaves you to enjoy her hilltop hide away in private. Comfortable rooms with Tea and Coffee and a fridge. Lovely pool and plenty of places to read in the shade between visits to all the local sights. A perfect spot to venture out to Florence, Sienna and everything else. Highly recomended. We were concerned that Le Boscarecce couldn’t possibly live up to the rave reviews it had received online. We needn’t have worried, the hotel and its wonderful owner Susanna exceeded all expectations. The setting was perfect, the rooms great, meals were high quality and very good value, the service was friendly, the pool was lovely and the tennis court was in great condition. We would never usually consider going back somewhere we’d been before – but I’m sure that we’ll make an exception in the case of Le Boscarecce. If you’re going to Italy, why would you want to stay anywhere else! This is, without a doubt, one my favorite places in the world! There is nowhere else I am able to relax as I can here. Susanna is the quintessential Italian hostess, full of warmth, humor, and knowledge about everything! I have visited 3 times, and plan to return this August. It is a definite destination for everyone at least once in their lifetime! SAN VIVALDOThe chapels of the Holy Mount of San Vivaldo are dated back to the 16th century and still preserve at their internal statuary groups in terracotta that represent different episode of life and Passion of Jesus Christ. THE BEGO MUSEUMa structure specially designed to host the detached frescos of two famous tabernacles (the Madonna of the Cough and the Madonna of the Visitation) that Benozzo Gozzoli painted locally in 1484 and 1491, respectively. The Church of Sant'Appiano was built during the 11th century (part in stone) and 12th century (part in brick) and now includes the Antiquarium Museum housing various Etruscan artefacts from the many necropoli in the area.